Cute captures as inset. and good thought provoking quote. Pretty mosaic and sparrows! Love the quote! Thank for sharing on Saturday's Critters. Have a happy weekend! Cytat ciekawy, a i Twoje zdjęcie jest sliczne. Pozdrawiam. Quote curious and and your picture is very pretty. Yours. The bare branches in winter does make it easier to see the birds. Love the quote. House sparrows have lovely markings. We truely do live with being outdoors! 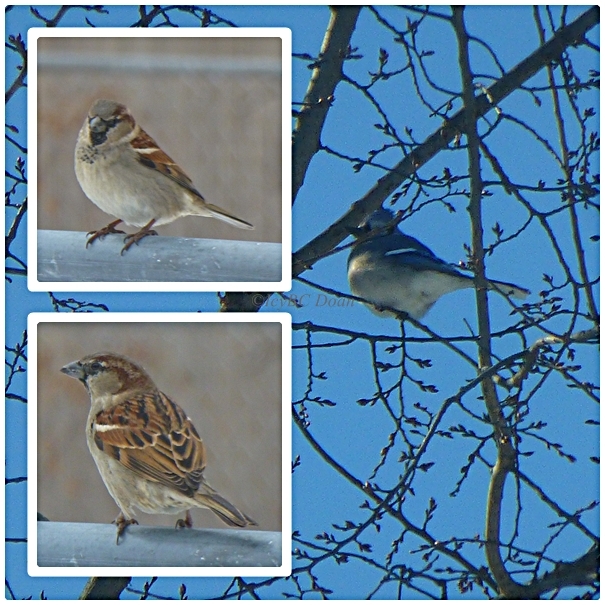 Icy, I just adore sparrows and these are just precious. Beautiful shots and mosaic. Now you not only have a collection of flowers but also a collection of birds. Very pretty feathers.